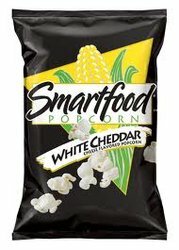 Smartfood White Cheddar Popcorn. A yummy popcorn that has great flavor without the calories. The white cheddar flavored popcorn is made with real cheese. Each bag only has 100 calories. And, it is Gluten and Soy free. It has 0 gramsof trans fat and no MSG. Each bag has only 100 Calories. Gluten and Soy free. No MSG and 0 grams of Trans Fat.